Currently Saturn is moving with what is called "retrograde motion," from left to right against the background stars. This is actually an optical illusion caused by the Earth's much more rapid movement around the sun. 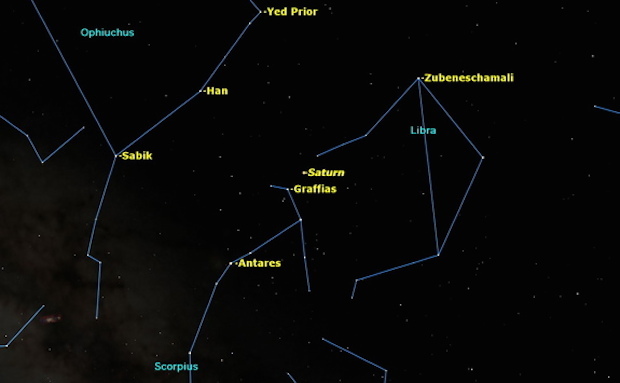 Once the Earth is well past Saturn in early August, Saturn will appear to reverse directions and begin moving in its true direction, from right to left. This retrograde motion puzzled early skywatchers, who thought the planets must go around in tiny circles called epicycles. This was because people once believed that the Earth was fixed in space and everything revolved around it -- the "geocentric theory." Once Nicolaus Copernicus made clear that the sun, not the Earth, was the center of the solar system, the geometry of the planets' motion became much simpler. Saturn, like all the planets, is much smaller in angular size than most people realize. I once tried an experiment to see how much magnification was needed to see Saturn's rings. With a binocular magnifying 10 times, Saturn looked just like a bright star. With a 15x binocular, I could just see a hint that Saturn was oval rather than round. It took a telescope magnifying 25 times to see Saturn's true shape, though even then no detail was visible. I generally use magnifications of 150 to 250 times to see the details of Saturn and its ring system. Saturn really has multiple rings, of which the brightest are the outer A ring and the inner B ring. The A ring is noticeably darker than the B ring, and the two are separated by the dark Cassini Division, named after 17th century Italian astronomer Giovanni Domenico Cassini, who was the first to observe it in 1675. Cassini also discovered four of Saturn's five brightest moons. Titan, the largest and brightest of Saturn's moons, was first spotted in 1655 by Dutch astronomer Christiaan Huygens. It is visible in even the smallest telescopes. Titan is the second-largest moon in the solar system, the only moon known to have a dense atmosphere, and the only moon other than Earth's own to have been landed on by a spacecraft. Saturn's smaller moons are worth looking for if you have a good telescope. The brighter ones are visible in a 90-millimeter telescope. Because they are in constant motion around Saturn, you need a planetarium program like Starry Night to identify which ones are visible on a given night. Most of the bright moons move in the same plane as the rings, so they appear to trace ovals around the planet. Iapetus is a particularly interesting moon. Its orbit lies outside those of the other bright moons, and it is tilted at an angle of 15 degrees compared with the other moons and the rings. Like all major moons in the solar system, Iapetus always keeps one face permanently turned toward its planet.